Find out how Rabbi Shlomo Carlebach inspired people to connect to their roots and connect to each other through music and Judaism. The annual tribute concert for Rabbi Shlomo Carelebach took place Saturday night at the Binaynei HaUmah international convention center in Jerusalem. Performing were Yehudah Katz, Ben Zion Solomon and sons, Chaim David, Chizki Sofer, Shlomo Katz, and Aaron Razel. Several of the performers spoke to Arutz Sheva - Israel National Radio telling stories about the man who inspired countless people. For the full podcast including interviews and classic Carlebach songs click here. Rabbi Shlomo Carlebach was born in Berlin, Germany in 1925 and passed away in 1994. Because of the Nazi takeover of the country, his family moved to Vienna, Austria, and then to Switzerland. Shlomo Carlebach moved to Lithuania and then finally to the United States just before the beginning of World War II. He intermittently lived in Canada and Israel. In America, he became a well-known rabbi who engaged in outreach work in the 1960s on college campuses and at music concerts at a time when few rabbis were doing such a thing. He also became a musician incorporating music into his teachings. He composed thousands of melodies and songs, such as Am Yisrael Chai and Esa Einai. He recorded over 30 albums of music and performed countless concerts including shows in the Soviet Union and Poland in the 1970s and 1980s. Yehudah Katz, one of the evening's performers, was one of those who made the arduous trip to Russia to perform in front of Jewish audiences. The event was organized by Jonty Zwebner of Pirsumei Nisa productions. Zwebner is also the founder of the popular One Song World online music resource. Ben Zion Solomon is one of the original residents of Moshav Mevo Modi'in, the agricultural community that Rabbi Carlebach founded and where he spent his summers. Solomon's sons are musicians as well. One is in the Moshav Band and another is in Soulfarm, both popular in Israel and America. Two of his other sons performed on stage with him at the concert, The two brothers also perform regularly at Menorah 8 in Jerusalem and in the rock group haMAKOR. Solomon described the event more like a family gathering rather then a packed concert hall. "We had some of my best friends play," he said. Solomon descibed how he first met Rabbi Carlebach in the early 1970s in San Francisco's Haight-Ashbury district. "Shlomo's Beit Knesset was called the House of Love and Prayer and every Shabbat people would come from all over the Bay area and spend Shabbat. There would be hundreds of people. We stayed up very late singing and dancing and celebrating. That was the key. Shlomo, in my opinion, saved post-Holocaust Judaism and made it into the Judaism of celebration instead of just mourning. From Shlomo I learned how to make G-d into your best friend." Solomon said that although Rabbi Carlebach avoided telling people what to do, he recommended that Solomon move to Israel. "It took us only about 30 days to pack up everything and leave for Eretz Yisrael. Shlomo joined us shortly after that and we've been there ever since," Solomon stated. Solomon has recently re-released some of his older musical material and has also released a CD of Breslov Hasidic songs for Moztei Shabbat. Chaim David also remembers Shlomo Carlebach from his youth. The popular musician based in the Old City of Jerusalem called the concert "a forum for people who knew Shlomo or people who came a little later. It's not just about making good music or arrangements its about people who connect to the idea of caring about your brothers and sisters so deeply," he stated. "It grows every year and people expect it," David stated. "People want to hear these songs all over again." He performed some little known Shlomo Carlebach melodies as well. 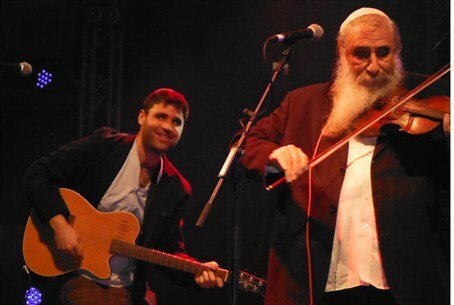 He, together with Shlomo Katz and Aaron Razel released an album in 2007 called K’Shoshana, which featured previously unreleased Carlebach compositions. Katz also helped create the Shlomo Carlebach Heritage Foundation, which has been releasing Torah commentaries in book format and other material. Chaim David said that Rabbi Carlebach was the type of person to lead by example. "He wasn't the type of person who said to do this or don't do that. He said 'come join us, let's make Shabbos together.'" For more stories including the flute in the synagogue, download the full interviews on the Israel Beat Jewish Music Podcast by clicking here. Arutz Sheva's J Jam with Adam Mallerman conducted a Carlebach podcats special featuring Mordechai Ben David, Yehuda Green, Avshalom Katz, Yeshiva Boys Choir, Inyan Acher, Shlomo Katz and more. To download click here.